Welcome to the Hess Family and The Hess Collection who will be at the VanWineFest 2019. Read about their history and wines, in their own words. As the first of the Hess Family Wine Estates wineries, Hess Wines is now releasing its 30th Mount Veeder vintage from vineyards first planted in 1978. True to his vision of what a New World wine should be, Donald Hess established his winery on the volcanic slopes of Mount Veeder in the Napa Valley and defined a whole new approach to winemaking. Along with its mountain vineyards, Hess Wines has also won acclaim for its other estate vineyards in Pope Valley and near the Carneros growing region of the Napa Valley and has long-standing partnerships on the North Coast with family-focused growers who share Donald Hess vision of sustainability and quality. The wines cultivated at The Hess Collection follow the dictates of the Napa Green certified land and winery programs, as well as the California Sustainable Winegrowing Alliance “Code of Sustainable Winegrowing”, both third-party certification programs with significant oversight. In 1910 the Hess Collection is among the first 17 wineries to be certified through the California Sustainable Winegrowing Alliance (CSWA) by third-party verification. Established by the Wine Institute and California Association of Winegrape Growers, CSWA requires adherence to a “process of continuous improvement” in the adaptation and implementation of sustainable winegrowing practices. Come taste these wines with Winery Principal, Dave Guffy, Senior Vice President, Winemaking & Viticulture. peaches and golden delicious apples, finishing crisp and clean with well-balanced acid. brown spices, with a delicious dust of cocoa on the finish. It is a blend of 80% Cabernet Sauvignon, 10% Petite Sirah, 7% Malbec, and 3% Petite Verdot. 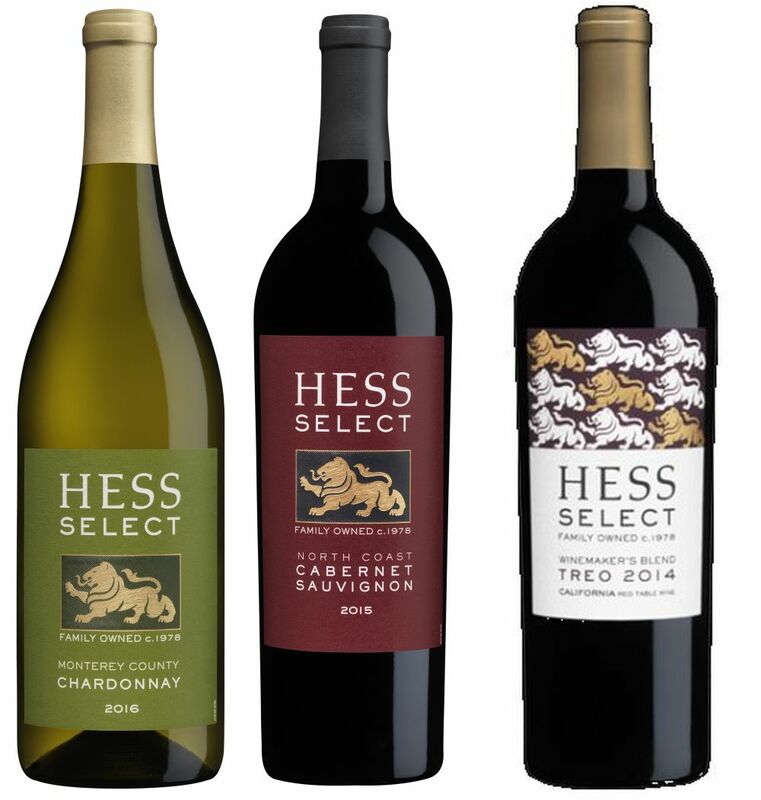 The Hess Collection Select Treo Red Blend $28.99 – Treo honours the next generation of the Hess family guiding The Hess Collection. Founder Donald Hess, joined by son-in-laws Timothy Persson and Christoph Ehrbar, form a trio building on the values and vision of the past while leading the way to a bright and innovative future. A blend of 36% Petite Sirah, 28% Syrah, 18% Zinfandel, 9% Merlot, and 4% Cabernet Sauvignon. The aromas call to mind a delicious barbeque with tamarind and sweet boysenberry lifting from the glass. On the mouth, bold, juicy red fruits lead to plush tannins and hints of grilled meats on the long, pleasant finish. The tannins are softer and easy drinking – we craft this blend to ensure the wine is accessible when you decide to open the bottle. The Hess Collection Allomi Mount Veeder Cabernet Sauvignon $39.99 – When much of Napa sees the summer fog, our Allomi Vineyard is often on the flip side, enjoying a bit of heat, which is just the thing for Cabernet Sauvignon. Pope Valley is less well-known than some notable Napa locations but the combination of steady heat and well-drained clay loam soils allows fruit to ripen evenly, gaining welcomed complexity and layers of flavours. Full-bodied, with classic Cabernet red fruit flavours set off by aromas and flavours of currant and blackberry, our Allomi Cab is noted for moderate, well-integrated tannins showing a round, plush mouthfeel. Distinct notes of vanilla and oak spice from ageing in American oak add to the personality of the wine, surely one of our most popular Napa offerings. 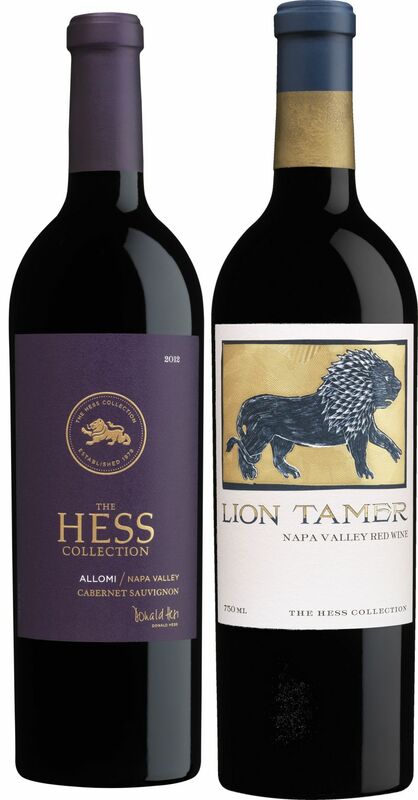 The Hess Collection The Lion Tamer Red Blend 2016 (Trade Only) – The Lion has been the emblem of the Hess Family for nine generations. It has come to symbolize the bold and persevering nature of founder Donald Hess and our winery home on Mount Veeder. The Hess Collection has long been known for its big, bold, mountain Cabernets and a little Malbec finds its way into many of our blends. The name Lion Tamer has become a nickname for Malbec because we use it as our tannin tamer. The signature of Lion Tamer is a generous palate of black raspberry and surprisingly lush tannins. Malbec serves as our “tannin tamer” in this wine, but on its own brings heady floral aromas of violets and bold, juicy flavours upon entry. Layering in Zinfandel, Petite Sirah and Cabernet Sauvignon create complex notes of black plum and blackcurrant with subtle elements of cocoa. The wine’s plush texture and ripe, juicy core of black fruit are brightened by 2% of Mourvèdre that deliver the perfect amount of cheerful red fruit. The 2016 vintage is a blend of 40% Malbec, 27% Zinfandel, 21% Petite Sirah, 8% Cabernet Sauvignon, 2% Mourvèdre, 1% Petite Verdot, and 1% Merlot.